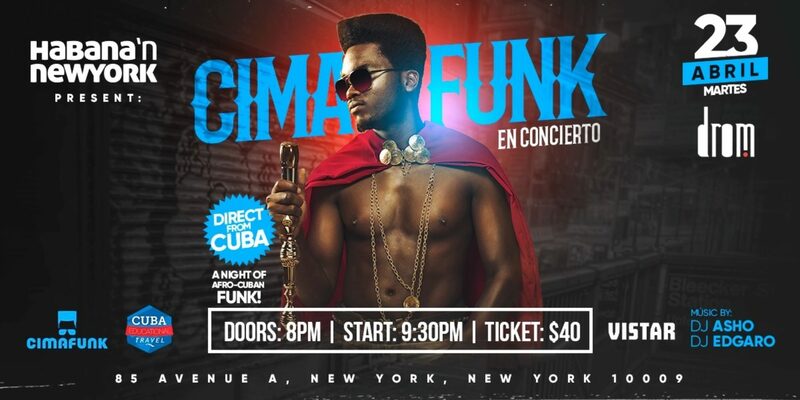 Cimafunk was just about the hottest new artist on the Cuban charts last year, and beware because the world conqueror has his sights set on New York City. If you’re in his path, our advice is to see him in person and surrender to the rhythm, and—hey—we want you to go so bad, we’ll give you the tickets. Habana’n New York and Afropop are giving away a pair of tickets to see Cimafunk on April 23 at DROM in Manhattan’ s East Village. Winning is simple: sign up for our enewsletter and send an email to info@afropop.org with “Cimafunk!” in the subject line. Then keep an eye on your inbox, we’ll email the winner a few days before the show. Cimafunk makes Afro-Cuban bliss—funky tracks that blend hip-hop and funk in Spanish, bouncing over relentless Afro-Cuban beats. He’s sold out shows in Washington, DC, Miami, Philly, Chicago, and New Orleans, so you’re going to want to get tickets to see him as soon as you can here.